David Chill's box set of colorful and brilliant mysteries capture both Raymond Chandler's gritty vision and Robert B. Parker's biting humor. Set in Los Angeles, these critically acclaimed books deliver intricate plots, witty dialogue and great characters! When shots are fired at a legendary sports agent, the prime suspect is the man's former business partner. But nothing is the way it seems in this gripping mystery, and as the close calls evolve into murder, the drama grows and the tension mounts. 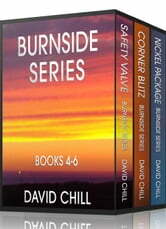 Combining an intricate plot with compelling characters, Burnside goes down yet another treacherous path. Fraught with wry humor, the unexpected climax of the story will take readers by surprise -- in more ways than one. The Governor of California's teenage daughter has gone missing, and it's happened right in the middle of a nasty re-election campaign. Adamant about keeping the investigation quiet, the governor brings in Burnside to find her. But when the case evolves into murder, everything changes and Burnside is plunged into a scenario where things are not what they appear to be. Cobbling together the world of politics, sports and teen romance, Corner Blitz moves through the wealthy canyon enclaves to the mean streets near downtown Los Angeles. And as Burnside overcomes the many obstacles in the investigation, he also comes face-to-face with his own past, one that haunts him to this day. The fifth Burnside mystery continues to deliver the witty banter and unexpected surprises that readers have enjoyed in this series. 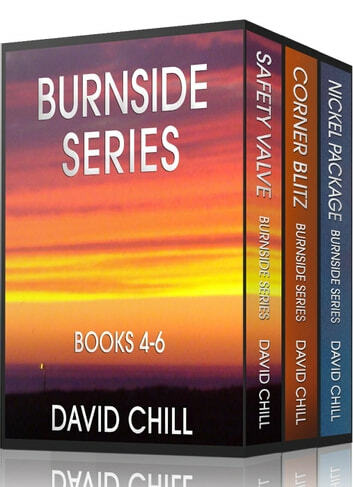 Corner Blitz follows Burnside on another tightly written mystery, loaded with plot twists, and finishes with an unforeseen, yet very satisfying ending. A vicious killer is on the loose. Their targets are connected, but the motives are unclear. Brought in by a Fortune 500 company to do a simple background check, Private Investigator Burnside is suddenly thrown into the middle of a sea of carnage. And as he moves forward into this harrowing case, his own life is placed in mortal danger. Desperate to find the culprit before they strike again, Burnside faces his biggest challenge yet, and one in which a single wrong move -- or an ill-timed quip -- could prove to be very deadly. Filled with unexpected obstacles in his journey, the story leads Burnside into the glitz of the entertainment industry, but as he pushes forward, he discovers the harsh corruption that lies seething beneath the surface. And it wouldn't be a Burnside novel if it weren't loaded with irreverent humor! Nickel Package delivers an exciting mystery that is both compelling to follow -- and marvelous to read. Story was good reading and hard to put down. I really liked David Chill's writing but I do not understand anything about American football, so all the script about football was a bit confusing. The story was good reading, hard to put down. The characters were believable.